This new mixed media Craftsman kit comes designed around an internal sturdy core on which to ‘hang’ the details. 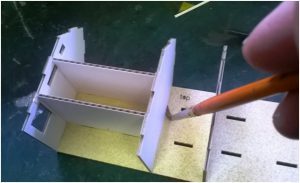 The core is constructed in minutes by gluing, (with a good PVA), together the numbered and slotted lightweight card parts in sequence and this makes construction very quick and accurate indeed. This first stage takes about 30 minutes. To make final painting simpler I lightly sprayed the parts first. But first a brief bit of background information. 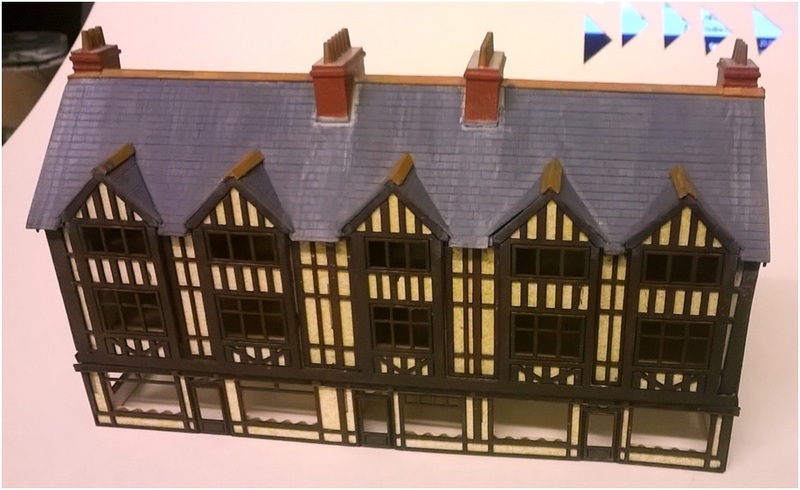 This Craftsman kit is roughly based around a block of buildings in Ipswich where the ground floor shops have been updated with large shop windows. The majority of the Kit is laser cut on one of our in house lasers with the chimneys being 3D printed to make construction even easier. 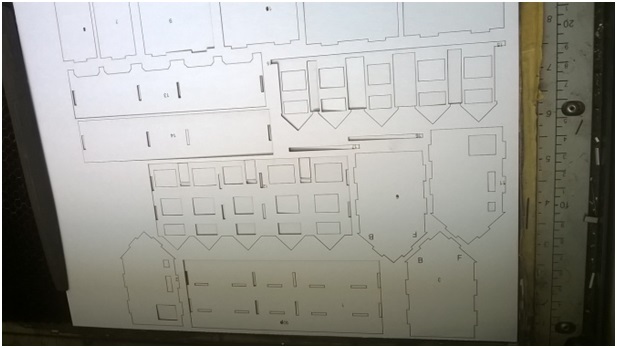 The illustration above shows the core parts cut out on the laser bed and right hand picture shows the individually numbered parts, as supplied, ready for assembly. The card core is built up by gluing together the numbered and slotted parts in sequence 2 to 1 and so on. This ensures the structure will remain square throughout the process. 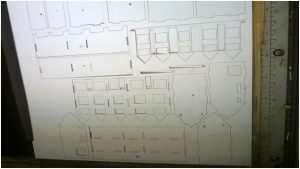 There is no provision for lighting but if you want to add lights you should punch holes where required in advance of this construction stage and add the lights as you proceed with the build up. Apply the PVA glue with a brush as illustrated here (left) where parts 1-6 are being glued together. As stated before this construction method ensures the structure remains square. Continue with the sequence until the construction reaches the stage of the right hand picture above. Next the front elevation is glued and slotted into place followed by the second cantilevered layer which is aligned with the tops of the apexes of the dormer windows. Ensure this job is completed with care as there are no slots for this stage. Add the two strips (15 & (16) at the sides corresponding with and at right angles to the front piece. When the glue has cured add the two roof sections. The front piece (13) should be fitted first and fully forward so that the top is in line with the ridge and engaged in the slots. The rear section, (14) is butted up underneath the front piece. Try having a dry run first to fully understand this stage. The next stage is to ‘hang’ all the 1/64th ply pieces onto the core structure. These pieces are also cut, and where appropriate, engraved on the laser. This process results in a number of parts which are best painted before assembly. This stage in the build takes a little longer to add all the pieces accurately. Paint these parts with acrylic or enamels but thin them down a bit first. 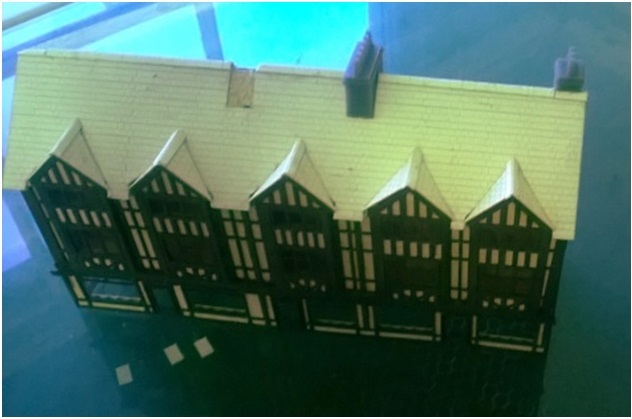 Half timbered buildings are usually painted black. Tip add about 20 % of a dark brown or dark grey to Matt black to take out the harsh blackness which if used ‘neat’ is unrealistic on models. Start adding the timber to the core by starting at the lowest level and building the structure on a flat surface. 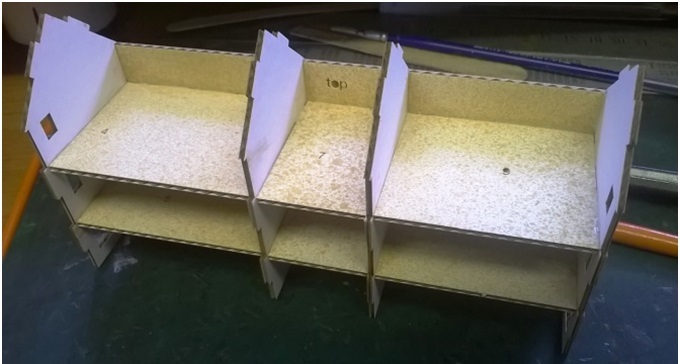 The long shop fronts should overhang equally at the ends but if you align the window with the core cut outs this is a simple alignment process. 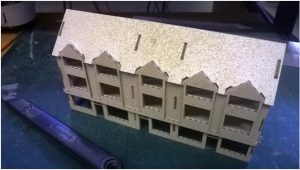 Continue up the front of the building by adding the large two storey piece, again aligning with the window apertures and dormer peaks. Followed by gluing the in between pieces all of which are different and should be obvious which ones go where. Add the side sections similarly and finally add the facia strips. Make sure the long front strip is the correct orientation and the mouldings match the doors. 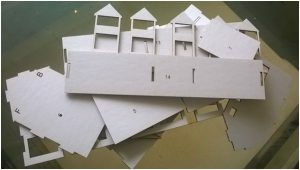 Next it is time to add the laser cut and engraved card roof sections. First glue on the long front making sure it is fully forward and level at the ridge. A dry run is useful here. Next glue on the back roof making sure the cut outs for the chimneys are all aligned. Form the dormer roofs which have a perforated cut to aid this process. Glue each in place in turn. When they are all set glue the ridge tile sections in place after first bending them into a ridge shape. Trim the dormer ridges at an angle to match the roof. Finally glue in place the 4 complete 3D printed chimney sections. These chimneys are also produced in house on our own printer and simplify the chimney building process which is usually a difficult job to get right! No need to roll individual pots out of paper with this kit! 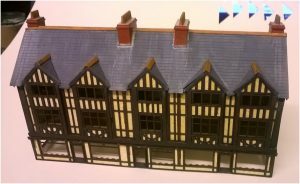 All that is left to do now is to paint the roof slates, ridge tiles and chimneys in the colours of choice. Again used thinned down paint as you don’t want to ‘flood’ the details. Tip Weather the roof tiles with streaking vertically from the chimney flashing for a more realistic roof. This is important as we usually view our models from an above perspective.